I finally took the plunge and decided to try out this mineral makeup I've been hearing so much about. And what a plunge it was. I threw out all my old makeup 'cause it was old and grody anyway. I spent $70.00 on eye shadows, blush, bronzer and foundation from Pink Quartz Minerals. But hey, it's good for your skin, good for the environment and no cute little animals were hurt to produce it. Good all around I'd say. So my makeup arrives. I wash my face apply my moisturizer and get to work. Included with PQM makeup are these small brushes, which the directions say are the best to use and give the best results. I give up after a few minutes and take out my own tried and true brushes. Nope these little brushes just aren't doing it for me. It appears that my old brushes work just fine and produce better results. I start with "Secret" eye shadow and brush it over my entire lid up to the brow. The color is very subtle on me so I don't look like a drag queen or anything. The shadow goes on very smoothly. I use "Spruce" over the lid. The two colors look great together and they blend very well. Happy so far. Next I use my eyeliner brush to apply "Ecstasy" shadow as liner. I line the entire eye. I move on to foundation. My shade is "Oasis". (NOTE: PQM sends you samples of foundation before sending you the full size. This way you know the shade you're getting is right for you. It's all included in the price.) Here's where it gets tricky. This type of makeup has a tendency to look streaky if you're not careful. It requires a light touch and lots of thin layers. So the application of it is taking longer than the usual liquid does. However, the effect looks airbrushed. I'd say it's worth the extra effort. Next I use my blush brush to apply their "Dusty Peach" blush. (I'm a fan of peachy colors for blush. I believe the perfect shade of peach exists for every skin tone. No matter what your color there is a shade for you. :) ) This too requires a light touch. It's easy to load too much on your brush. I recommend applying it in thin layers as well. I finish with some lip gloss and mascara. Everything looks awesome! The overall effect is airbrushed and the colors are very subtle and pretty. If you have oily skin like me, skip the moisturizer and use a shine control product instead. After a short while I ended up having to blot and touch up. Definitely use an eye makeup base like Clarins Instant Light Eye Perfecting Base. The shadow will crease without it. Later on when I washed it off my skin looked really good! It’s almost like the makeup itself acted as a skin conditioning treatment. I would definitely recommend this product to everyone. If you have time to spend putting on your makeup then this is a great way to go. If you are in a hurry though you may want to use liquid foundation, at least until you get the hang of it. 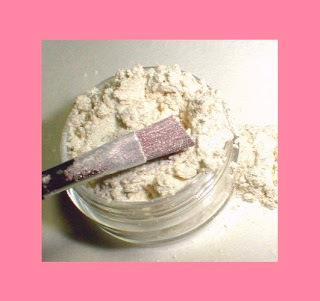 Find some good mineral makeup here. I always wondered about mineral make-up. Thanks for the information! I always wondered, too! I'm interested!!!!!!!!!!! Especially for foundation because I don't really wear eyeshadow. How did you pick a brand? Ill see if I can get some pix today. I knew I wanted to go with someone on Etsy because I like to support indie shops. Basically what I did was type in makeup at Etsy and PQM came up so I took a chance and decided to try them. I like the product so it came out all good. There are other on Etsy and I'm sure there are some in dept stores. That might be a good bet for you so you can try before you buy. Or you can even email some of the etsy shops and see if they'll send you samples. Cool tips! I have the Bare Minerals foundation, and I like it, but just the downside is that it's messy. But yes, it's made of natural stuff, and you can even sleep with it hehe.